Dental implants are used to replace missing teeth. They can be used to replace one tooth, many teeth, or all your teeth. 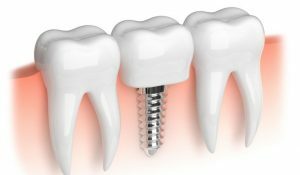 Dental implants are fixtures, usually made out of titanium, that are surgically placed into your jaw bone by a dental professional, creating “anchors” for beautiful and natural looking restorations. They also provide a “fixed” solution for removable full or partial dentures, by allowing the denture to “anchor” to the implants, creating a more esthetic, comfortable, and functional restoration. These are called implant-retained dentures. These types of dentures will basically snap onto the implant anchors.